A four-vehicle crash on the Dallas North Tollway at Windhaven Parkway caused delays for drivers in Plano Thursday morning, but all lanes have since been reopened, officials said. The Department of Public Safety responded to the crash about 11 p.m. Wednesday night. 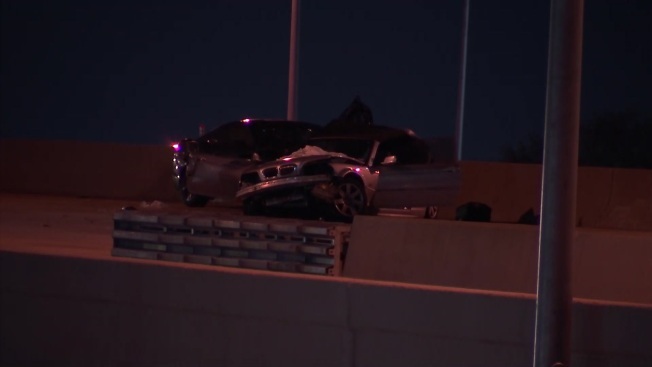 A Ford Mustang was traveling north on the tollway when, for an undetermined reason, the driver collided with a BMW sedan that was also headed northbound, DPS spokesman Lonny Haschel said. The Ford spun out and hit two other vehicles, Haschel said. The driver and passenger of the BMW were hospitalized with serious injuries, Haschel said. The driver of the Mustang was arrested on suspicion of driving while intoxicated, Haschel said. The other occupants in the other vehicles were not seriously injured, Haschel said.